At the same time, the ousted former President Hadi has stated that he is willing to declare a ceasefire if the Ansurallah (Houthis) withdraw from territory they have taken over the last year including the capital of Saana. 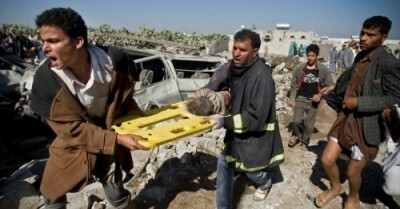 On Friday the old city of Sanaa was bombed extensively killing women, children and seniors. Historic buildings were destroyed using warplanes and ordinances made and supplied by the Pentagon and NATO countries.